Put 250g couscous in a bowl, pour over 300ml boiling water, cover with cling film and leave for 5 minutes. (Add 1 tsp honey to the hot water if you want a touch of sweetness.) Quarter eight small figs. Toast 50g pine nuts until golden. Grind four whole cloves in a pestle and mortar or measure ¼ tsp ready-ground cloves. 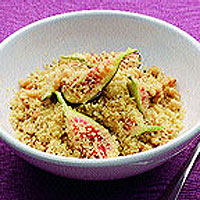 Toss the couscous, figs, pine nuts and cloves together in a large bowl, season well and serve as part of a buffet spread, or spoon on to a plate as a bed for roast lamb or grilled sea bass.